I think you were mighty kind to ask your publishers to send me a copy of your book of verses4. It reached me on the same day that a book of verse by Ford Madox Hueffer5 arrived from Winchelsea6, and I felt blessed beyond my deserts to be remembered of two poets. I love the enthusiasm and riotous youthfulness of the Harvard Ode7. Many of the lyrics I knew. But where, O where, is that extremely beautiful one upon a Jewess that you once read to Miss Roseboro'8 and me? What misguided friend ever persuaded you to omit that truly lovely thing? I am glad you included "The Fruits of the Earth"9 at any rate. Thank you for sending the book to me. Let me congratulate you heartily and wish you strength of purpose and lightness of heart and all good things. 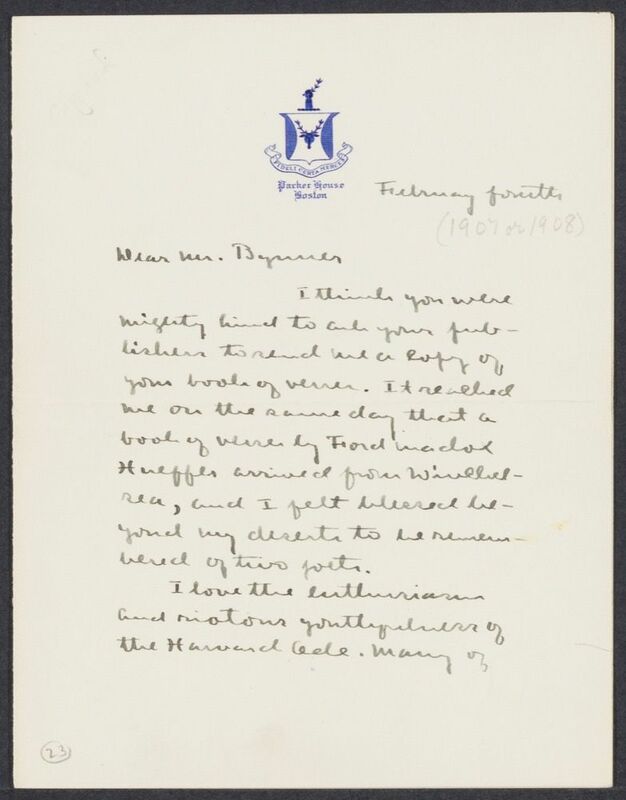 Internal evidence suggests that this letter was likely written in 1907 as Bynner's book referenced in this letter, An Ode to Harvard and Other Poems, was published in 1907. The motto translates, "To the faithful there is certain reward." Bynner, Witter (1881-1968). American poet and playwright. Born in Brooklyn, NY, Bynner spent most of his childhood in Brookline, MA, and graduated from Harvard University in 1902. The same year he joined the editorial staff of McClure’s Magazine in New York City, first as an office boy and then as assistant to literary editor Viola Roseboro’. He also worked on matters pertaining to the associated book publishing firm McClure, Phillips, and Co. Bynner sent copies of Cather’s The Troll Garden (1905), published by McClure, Phillips, and Co., to Henry James, Sarah Orne Jewett, and Margaret Deland; he conveyed back to Cather James’ dismissive response about American women authors. 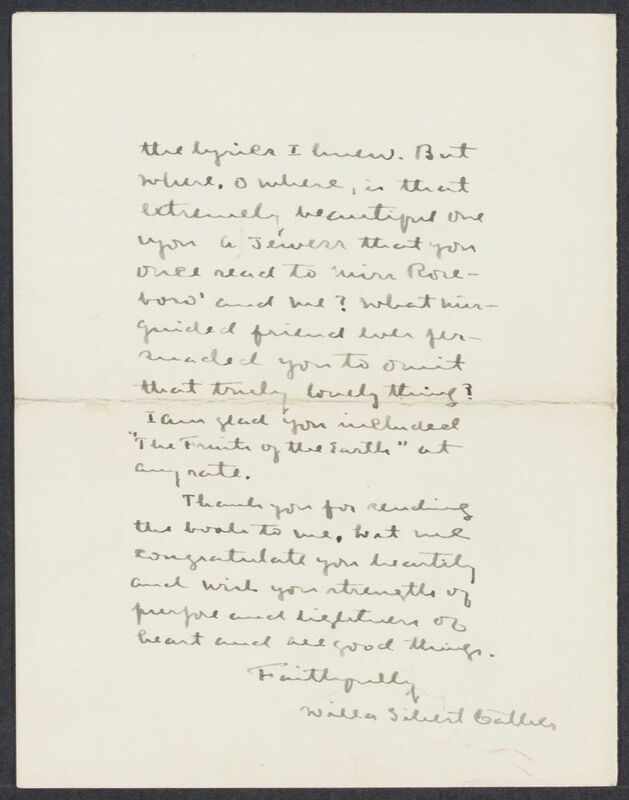 Bynner left McClure’s in 1906 to concentrate on his poetry and sent Cather a copy of his first book of poems, An Ode to Harvard and Other Poems (1907), to which she responded graciously, but by 1915 she used his name as a shorthand for the worst of modern poetry. In 1916 with his fellow poet Arthur Davison Ficke, Bynner undertook to satirize the Imagist school of poetry by concocting a fake school of poetry, the Spectrics. Bynner assumed the persona Emanual Morgan while Ficke became Anne Knish; they maintained the façade until the 1920s. As a result of a trip to Asia in 1917 with Ficke, Bynner became interested in Chinese T’Ang Dynasty poetry and collaboratively produced a volume of translations with Kiang Kan-hum, The Jade Mountain (1929). He also continued to be a prolific author of original verse. He and Spud Johnson, his secretary and lover, traveled in the American Southwest and Mexico with D. H. and Frieda Lawrence in 1923. Bynner subsequently visited Santa Fe, NM, frequently and bought a house there in 1940. Bynner published a memoir of D.H. Lawrence, Journeys with Genius (1951). After Cather’s death, he was critical of Cather in print, and in letters he spread misinformation about her early career. From 1930, admirer Robert Hunt was his lover and personal assistant. He died in Santa Fe soon after the sudden death of Hunt. Ford, Ford Madox (1873-1939) (“Ford Madox Heuffer”). British author, editor, and critic. Born in Surrey, England, Ford Madox Heuffer was brought up in London. In 1894 he eloped with his school friend Elizabeth Martindale, whose father opposed their marriage. The couple had two daughters and lived in Winchelsea, where Ford Hueffer befriended many local authors, including Joseph Conrad, with whom he collaborated on Romance (1903), a novel about pirates. After a 1904 breakdown, he spent time in Germany; on his return to England, he lived mostly in London, apart from his wife and children, and established the English Review. His novel The Good Soldier (1915) established his reputation as a novelist, but his complicated romantic life and his wife’s refusal to grant him a divorce undermined his personal reputation. After serving in the British Army during World War I, in 1919 he changed his name to Ford Madox Ford. He lived in the Provence region of France during the 1920s, and then in the U.S. from 1929 until his death. On a 1909 trip to London for McClure’s Magazine, Cather met Heuffer and was disappointed that he failed to arrange a promised meeting between her and Conrad. Ford’s account of Cather’s time at McClure’s in his memoir Return to Yesterday (1932) contains multiple obvious errors, and Cather disputed the accuracy of his account of her 1902 meeting with A.E. Housman. 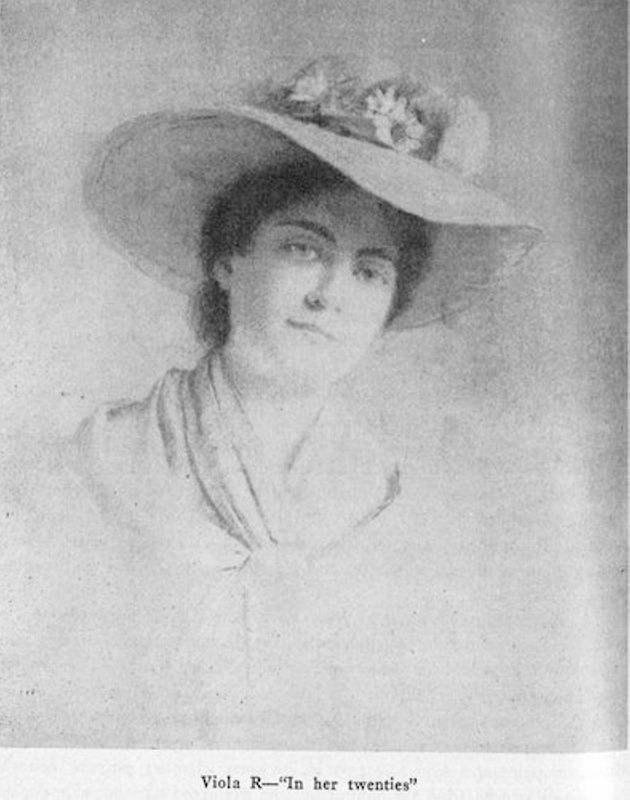 Roseboro’, Viola (1857-1945). American editor and author. Born in Pulaski, TN, to parents whose abolitionist sympathies caused them to flee the state shortly before the Civil War, Viola Roseboro’ graduated from Fairmount College in Monteagle, TN. Before moving to New York City around 1882, she was an actress with a traveling stock company. In New York she worked as a journalist and began publishing short stories in magazines while continuing to tour occasionally until she left the stage permanently in 1887. Roseboro’ actively published fiction for the rest of her life, including The Joyous Heart (1903), a Civil War novel critical of Southern slavery, and Players and Vagabonds (1904), a collection of stories about the theater. Having sold short stories to the McClure fiction syndicate in the 1880s, in the early 1890s she began evaluating manuscripts for the syndicate and soon did the same for McClure’s Magazine and book publisher McClure, Phillips & Co. Cather evidently first met Roseboro’ in 1903, when S.S. McClure called her to New York to discuss her fiction; the two women began corresponding, and Roseboro’ may have influenced McClure’s decision to hire Cather as an editor for his magazine in 1906. When most of the magazine editorial staff walked out on McClure that year, Roseboro’ stayed, but when S.S. McClure lost control of the magazine in 1911, she left for Collier’s Weekly. When her position there ended, she moved to Staten Island and struggled to support herself as an author’s consultant. When S.S. McClure regained control of his magazine in 1921, she rejoined the staff and took an apartment at 13 Bank Street, but the position did not last long and she was soon struggling to support herself again; a 1928 bequest from a friend alleviated her financial distress and allowed her to live comfortably abroad and in New Dorp on Staten Island. Cather’s letters to Roseboro’ suggest that, long after she became an established author, Cather valued Roseboro’s friendship and her judgment in literary matters. She particularly valued Roseboro’s response as a Southerner to Sapphira and the Slave Girl (1940), an advance copy of which she sent to her.